Learning to live in harmony with what is real and what is not is like learning how to ride a two-wheeler all over again. You’re going to fall and it’s going to hurt, but eventually you will learn that delicate balance required to carry you to your destination. Near the end of the 1946 movie, “The Razor’s Edge,” Tyrone Power’s character comments on his searching: “It isn’t easy and it isn’t fun. 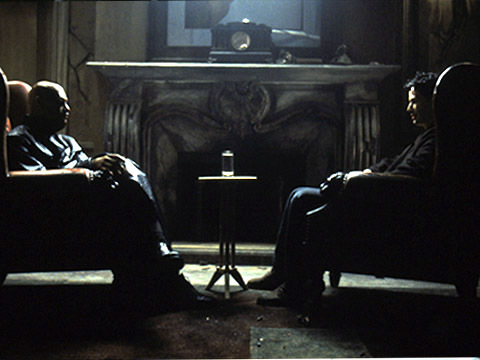 I’ve known moments of futility and frustration…” well, you get the point. So, let’s take a look at life outside the Matrix. ॐWhen we begin to awaken, our compassion grows. Our thoughts turn away from competition to thoughts of cooperation. Not so concerned anymore with what we can get for ourselves – be it glory or more material things – we become more concerned about how can we alleviate the suffering of others. Tolstoy, who became enlightened in his later life, said: “The sole meaning of life is to serve humanity.” Throughout the past, there have been individuals who walked this path, inspiring others toward peace, justice, and equal rights for all: Jesus, Gandhi, Abraham Lincoln, John F. Kennedy, Martin Luther King, Robert Kennedy, John Lennon, Malala Yousafzai, just to name a few. It shouldn’t escape anyone’s notice that everyone I just mentioned either met a violent end or, as in Yousafzai’s case, was targeted for assassination. There have been others, of course, who have met similar fates, and many more that will never be known beyond their own small circle of life. Keep walking the talk. ॐ When we begin to awaken, we become intolerant for anything that might pull us away from the still mind and pure heart we are trying to establish. We may find parts of our old life fall away. This can be scary. Don’t worry, new will replace the old, as an old friend used to remind me, “You have to empty the cup before it can fill up again.” Don’t resist this process. ॐ When we begin to awaken, we may want to isolate ourselves from the noisy, divisive world, as it no longer satisfies us. 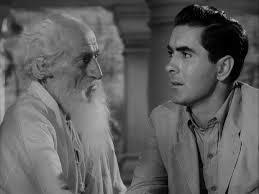 After Tyrone Power’s character begins to awaken to the Truth, he expresses the desire to stay secluded so he never has to leave the bliss he’s found. The holy man tells him, “It’s not necessary to leave the world…but rather to live in the world, and to love the objects of the world, not for themselves alone but for what there is in them of God…” So, while it is absolutely necessary to give ourselves that respite to reflect and renew, it is unrealistic to think that we can isolate forever, however tempting that might be sometimes. Besides, you will progress more quickly by staying in the world and learning how to balance while treading the razor’s edge. It isn’t easy and it isn’t fun….well, you get the point.